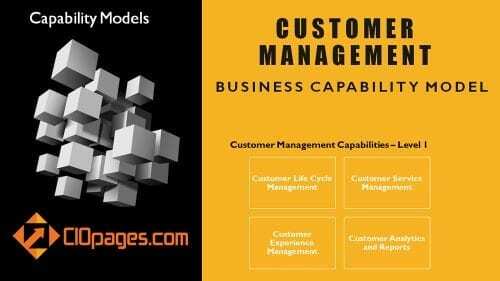 Finance and Accounting Business Capability Model: The CIOPages.com Finance and Accounting business capability model is a hierarchically decomposed list of Record to Report capabilities which captures the end-to-end entities that span the finance and accounting function. The accounting and finance business capability map helps in evaluating the maturity of the finance discipline, understanding the strengths and weaknesses so as to craft a capability evolution roadmap. Finance and Accounting are no longer just a recorder of the past. Finance and Accounting have emerged as a vanguard of harnessing the resources of an enterprise to elevate the performance. A structurally sound and stable business capability model helps make sense of advanced accounting and finance functions. What is in the Finance and Accounting Business Capability Model? 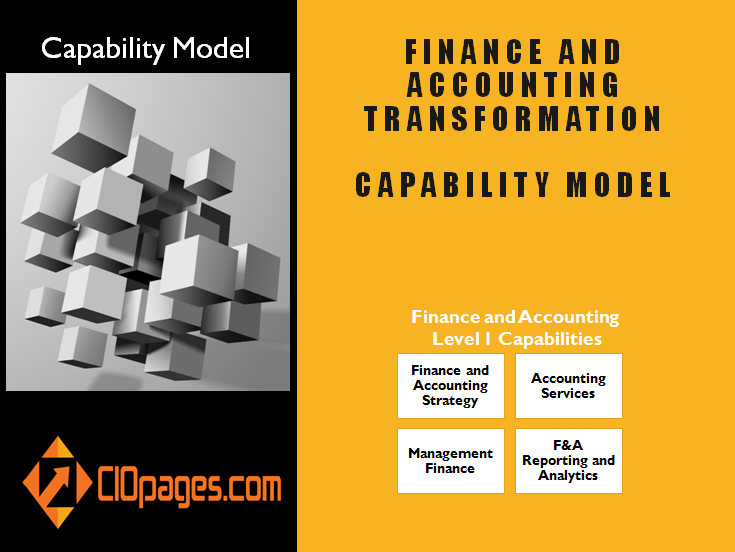 The Finance and Accounting capability model is a hierarchical decomposition of about ~110 business capabilities spanning all Finance and Accounting functions. Why do we need a Finance and Accounting Business Capability Model? The value of business capabilities is undisputed as they help bridge the gap between business and IT, help understand the essence of what a business does, and align development efforts to strategic priorities, which helps evolve and enhance capabilities. Ideally, your firm should have a structured and well-defined enterprise business capability model. For the capability model to the actionable, it should be decomposed to a granular level of capabilities (at least Level 3 and some times to Level 4) for it to be practical and to be able to leverage in IT enablement projects.As we discussed before, Finance and Accounting has emerged as an essential function which orchestrates organizational resources with the aim of elevating corporate performance. CIOPages Finance and Accounting Capability model captures a detailed view and a nuanced perspective of what Finance and Accounting function do. It includes the essential features as well as emerging and value-add functions/capabilities. The model will help provide a jumpstart to envision a future state, conduct a gap analysis, identify capabilities which are needed/improved, and help focus efforts on capabilities that matter! What’s inside the Finance and Accounting Business Capability Model? The Finance and Accounting Business capability model is decomposed to a minimum of two levels across the spectrum of Finance and Accounting functional capabilities and, many a time to level 3 and visible level 4, depending on the granularity and modularity required. 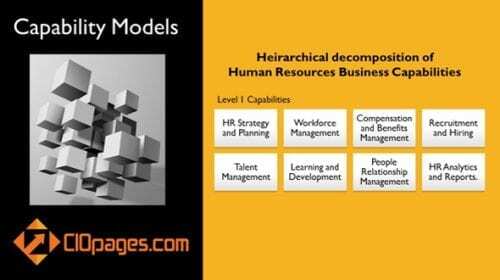 The capability model is structurally sound, internally coherent and maintains principles of MECE (mutually exclusive and collectively exhaustive), for the most part. 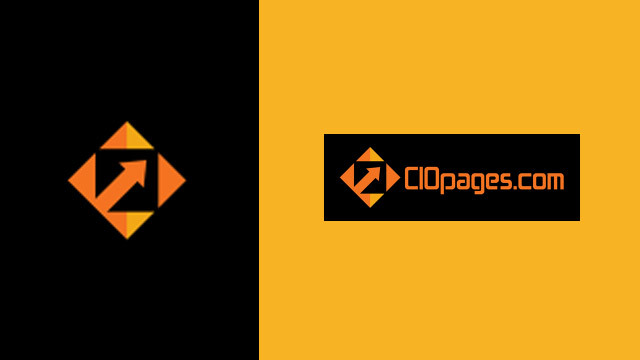 The CIOPages.com Finance and Accounting business capability model is a digital product and hence absolutely no returns or refunds. A generic capability model may or may not fit your needs, or the percentage of relevance will vary widely. Consultants and consulting firms who want to use it for their clients have a different pricing model. The sale is for the model only and does not include customization or implementation help. Business Capabilities describe “What” business does. Business capabilities act as the foundational building blocks in business architecture as they are the stable components and solid entities to model a business. There is a lot of information on capabilities at Capstera. 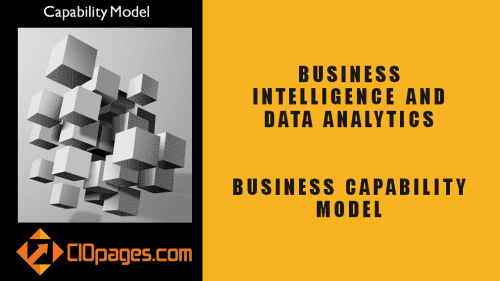 What is the value of a Business Capability Model? A well-structured business capability model aligns business and technology. A granular capability model (not too high level) allows for mapping to technology components to understand the functional sufficiency and footprint of applications to meet business needs. Using capabilities as Lego blocks, business owners and product managers can communicate their needs better so as to allow for optimal technology enablement. 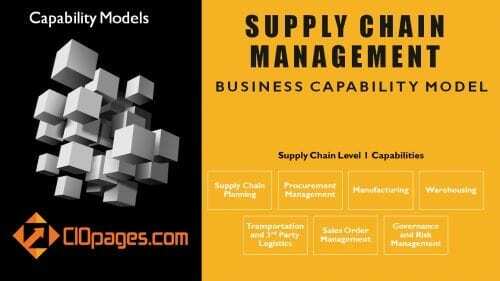 A detailed capability model helps in vendor evaluation and selection. It helps you identify conflicts, overlaps, and redundancies and zero in on the weak areas so as to develop a roadmap to evolve the capabilities. Will a generic Business Capability Map fit our unique needs? 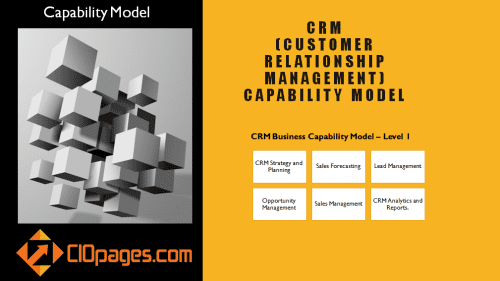 The goal of CIOPages.com business capability maps is to meet or beat a threshold of 75-80% relevance. There is always that 20-25% that may need to be modified and customized to capture the unique essence of your enterprise. Also, having a pre-built straw model helps in a) not missing out on the core and distinct business capabilities and b) spend 80% of your time on the 20% of the capabilities that make you who you are! But I’ve seen this entire Capability Map depicted as ONE BOX. Why so many Capabilities? The problem with some of the mickey-mouse capability maps is that they are too high level and are nothing more than a few boxes and arrows that can become Wall Art. For a capability to link strategy to execution, and to bring about functional enablement at a feature/function level, a well-structured and deeply-decomposed business capability map is essential. 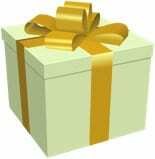 Can you help us customize the business capability model to our enterprise needs? We are glad you asked! Yes, of course. Our domain and functional experts can contribute to take these straw capability maps and customize to your needs. With a full-fledged model as an accelerator, the work will be fast, efficient and effective. Contact us for Advisory/Consulting Services. The domain knowledge and intellect that went into constructing the capability models is very high. The cost is less than 2-hours of time of a low-priced consultant. Or perhaps the cost of pizza lunch for the team to brainstorm and whiteboard the capabilities. Consider the ROI: B) The hours of work it will have saved your team if they tried to build something from scratch. B) The time saved due to the straw model covering 75-80% of your needs. And c) the value of focusing on what makes you unique rather than work on the entire list of capabilities.